Kristine Beeson, also known as kadyellebee on Etsy, is a wonderful knitter of shawls and other lovely things. 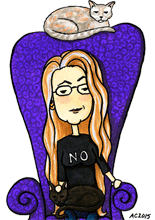 When our paths crossed and she expressed a wistful interest in being made into a Cartoon, I took the opportunity to offer her barter — a shawl for a cartoon! She helped me choose the perfect yarn (a warm, lightweight blackberry-colored cotton), and got right to work so I’d have my shawl while winter was still upon us. 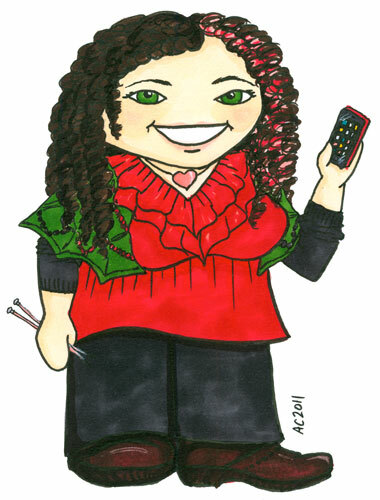 I was a bit slower, but I’ve finally finished up her cartoon (alas, I was waiting on marker refills). She sent me some great photos of herself and her cheeky grin, not to mention her favorite outfit, and despite a bit of a struggle to get my scanner to accept the idea of hot pink, this is a pretty good representation of her and her gorgeous pink-striped hair. She asked for her ubiquitous iPhone, but I couldn’t resist slipping some pink knitting needles into the image, as well. The pattern she knitted for me is called wren, and you can see her very own wren shawl on her cartoon above, in a soft mossy green that goes great with her eyes. Mine’s a dark purple that’s not quite black, but looks great where it lives on my blue chair, waiting for me to get cold while I’m working. It’s just light enough for me to forget I’m wearing it, but it keeps the cold off my aching shoulders. What a fun representation you’ve created, Amy. 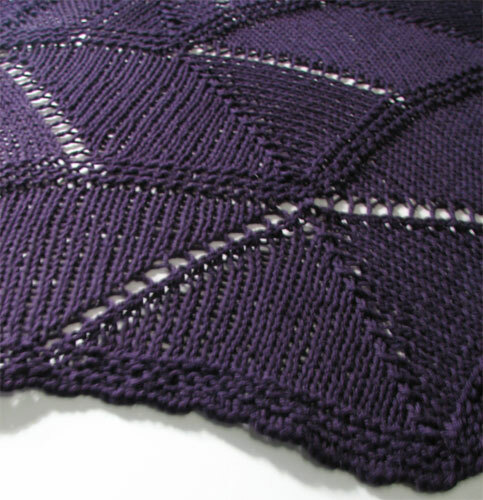 And the shawl looks absolutely luscious! Congrats on your new email newsletter, too — love it! Looks like a win/win for two very talented people. Love the cartoon! I LOVE it! you did such a beautiful job, and the whole process of turning myself into a weeble was delightful. It’s a wonderful shawl! Just what I’d been wanting. And thank you – I had a lot of fun with Kristine’s weeble. I think we’re both quite pleased with how it turned out — thanks! Hooray! The process of picking yarn and getting my shawl was equally awesome — I love that you also do custom as well as the Etsy shop stuff.